Trump’s negotiator: We will be presenting a plan that is fair, realistic and implementable. There will have to be compromises of course. WASHINGTON (JTA) — The best thing everyone except for the Israelis and Palestinians can do when the Trump administration reveals its peace plan is to be supportive, Trump’s chief negotiator said. And nothing else. “It really is up to the Israelis and the Palestinians; they’re the ones who will have to live with the consequences of the plan,” Jason Greenblatt told the Jewish Telegraphic Agency in an interview Tuesday in his office near the White House. His plea came at the end of an interview, underscoring its importance. In the past, parties not directly involved in the conflict have frustrated and even scuttled delicate negotiations, often with Jerusalem as the sticking point. 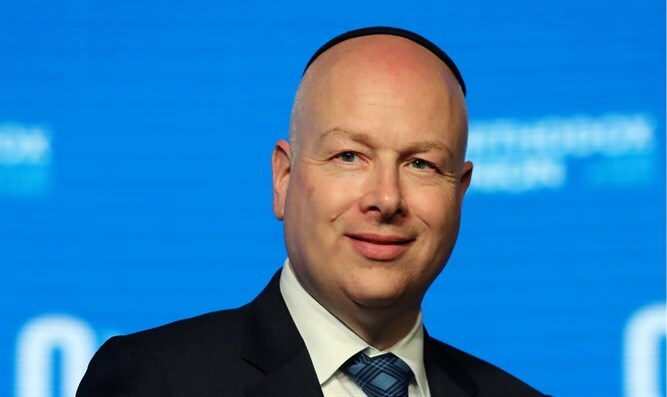 Greenblatt confirmed that the plan would not see the light of day before the Israeli elections on April 9, but would not set a deadline for how much longer afterward it would come out. Coincidentally or not, Greenblatt and President Donald Trump’s son-in-law Jared Kushner, who is taking the lead on the plan, have assiduously courted the two groups that have frustrated compromise on Jerusalem in the past — US Jewish organizations and US Arab and Muslim allies. Greenblatt frequently speaks with Jewish groups at their conferences, keeping the briefings off the record. He and Kushner just pitched the peace plan to six Middle East nations. Part of their pitch to the Sunni Arab states reportedly has been funding for the Palestinians. Congress and the Trump administration have cut virtually all relief assistance for the Palestinians. Greenblatt in the interview would not address whether the Trump administration solicited funding requests from the Arab states, but he again emphasized that economic security was critical. Palestinian leaders have been skeptical of the economic spur promised by the Trump administration, saying it is a smokescreen for getting Palestinians to give up on statehood and Jerusalem. Greenblatt dismissed speculation as counterproductive and said he was getting his message across — through Twitter, among other platforms — to “ordinary” Palestinians, even while the leadership remains aloof. In the past, Jerusalem often was the issue drawing third-party attention. In 1995, the American Israel Public Affairs Committee successfully pushed for a law that recognized the city as Israel’s capital, much to the consternation of then-Israeli Prime Minister Yitzhak Rabin and then-President Bill Clinton, who wanted wiggle room to keep the Oslo process alive. In 2000, it was Arab and Muslim leaders who warned then-Palestinian Authority chairman Yasser Arafat that he compromised on the city at his peril, a posture that helped cripple and then kill the Camp David talks. Saudi Arabia, which controls the two top Muslim holy sites, would not endorse a Jerusalem compromise. Now, however, Trump administration officials have made the Saudis a key ally in peddling the plan. And in 2007, after the George W. Bush administration launched the Annapolis talks, then-Israeli Prime Minister Ehud Olmert lashed out at US Jewish groups that cautioned him against sharing Jerusalem. If Jerusalem is an issue this time, it will play out differently. President Donald Trump reversed the policy of his predecessors and recognized the city as Israel’s capital, last year moving the embassy to Jerusalem. Palestinian leaders are furious with Trump for the move and have not spoken with Greenblatt for over a year. Greenblatt said in the interview that “all core issues” will be addressed in the plan, although he would not elaborate. Under the conventional understanding of the term, “core issues” would include Jerusalem, Palestinian statehood, borders and Palestinian refugees.